The Echinopsis genus of cacti includes dozens of species from South America. This group includes large columnar cactus that were formerly in the genus Trichocerceus, as well as the smaller day-flowering species that were previously classified in the Lobivia genus. The large columnar cactus are beautiful, but they are generally far too large for indoor cultivation, so only the smaller day-flowering species are grown indoors and are now classified in the Echinopsis genus. 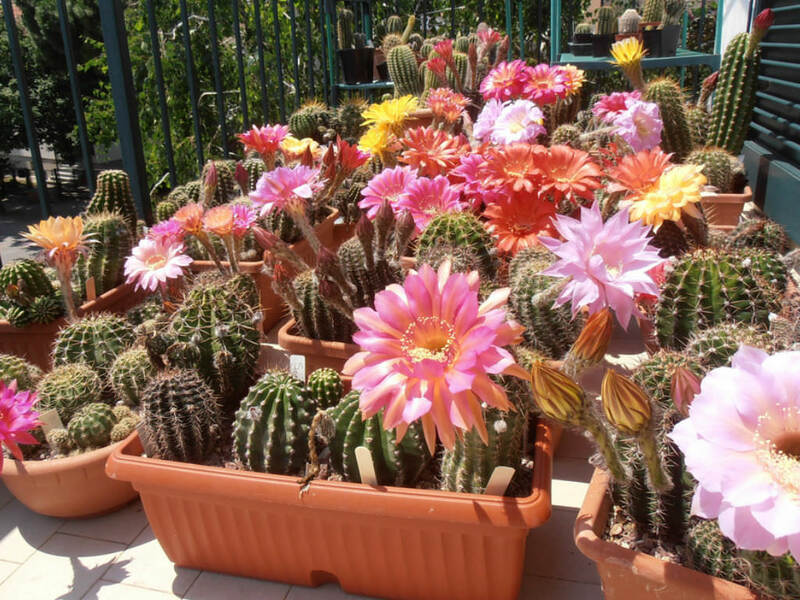 These are generally small, round cacti with sharp spines and very colorful flowers. Extensive hybridizing has been done over the years to produce a variety of flower colors. Light: Like many cacti and succulents, the Echnopsis appreciate strong light during the growing season. Move plants outdoors if possible, but acclimate to direct sunlight slowly to prevent scorching. In the winter, a southern exposure is perfect. Water: Allow the soil mix to become nearly dry between waterings, but then water thoroughly. Immaculate drainage is essential, so never let the pots sit in water. Suspend watering in the winter, but mist occasionally. .
Echinopsis can be easily rooted from offsets, which tend to cluster around the base of the mother plant. Cut offsets close to the stem, at the narrowest possible place. When rooting cacti from cuttings, let the fresh cutting dry out slightly on a paper towel and cut the cacti at the narrowest place possible. After a few days to a few weeks, depending on the size of the cut surface, the cut surface should have dried out and formed a callous, or slightly rough opening. Once the callous has formed, place the cutting in a rooting mixture of fast-draining cacti soil. Keep the cutting barely moist and warm. New roots will form in a matter of weeks, either around the vascular bundles or the cut areoles near the cut. Once new roots are visible, pot the plant as a typical cacti and move it into your collection. Repot as needed, preferably during the warm season. To repot a cacti, make sure the soil is dry before repotting, then gently remove the pot. Knock away the old soil from the roots, making sure to remove any rotted or dead roots in the process. Treat any cuts with a fungicide. Place the plant in its new pot and backfill with potting soil, spreading the roots out as you repot. Leave the plant dry for a week or so, then begin to water lightly to reduce the risk of root rot. Be careful when handling Echinopsis as they have stiff spines.